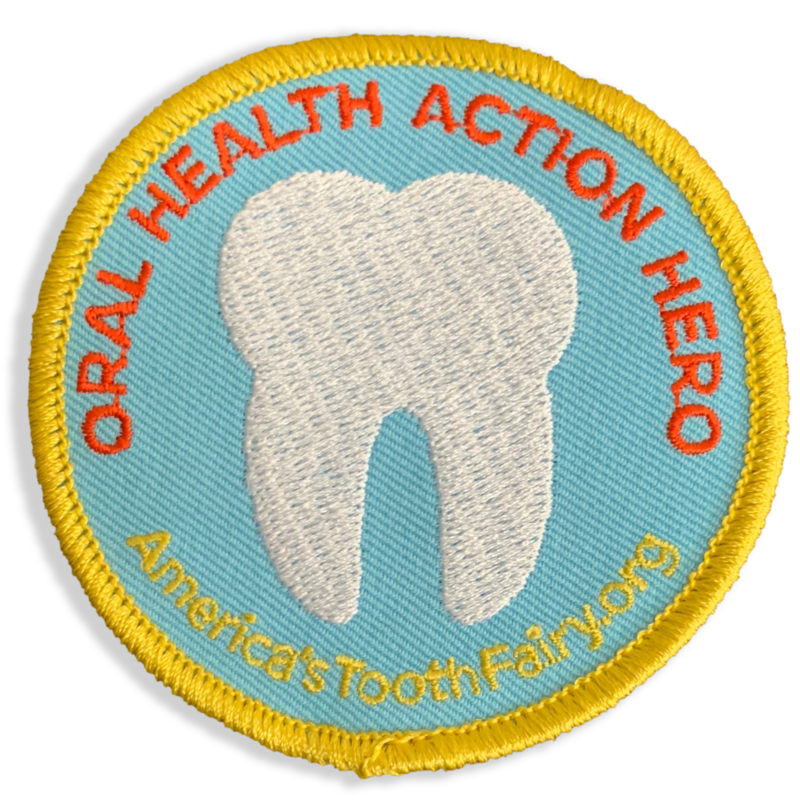 In November of 2018 America’s ToothFairy putout the call to Scouts across the nation to teach their communities about oral health and earn their “Oral Health Action HERO” patches. Thanks to a generous donation from DentaQuest, the patches were available at no cost for their participation in America’s ToothFairy’s Health Education and Resource Outreach(HERO) Program. Scout troops flocked to register as participants and within days all 2,000 patches had been reserved. The HERO program engages participants in addressing oral health issues unique to their geographical area by conducting research; teaching children, teens, parents and community leaders about the importance of oral health; and promoting positive oral health behaviors in their communities. Since November, twenty-three troops have completed projects and collected more than 3,600 oral care products for children in their communities. “Our scouts visited Giggles & Grins pediatric dental office to learn about oral hygiene,” reported Jamor Klopfenstein, leader ofTroops 4042 and 4037 in Southlake, Texas. “They learned about baby and adult teeth, how to properly brush their teeth and floss, as well as how important it is to visit the dentist every six months for a cleaning and checkup.” Other troops learned about water fluoridation, made oral health posters that were hung at community centers, simulated the effects of acidic beverages on tooth enamel with eggs, and gave presentations to homeless children. • Holding a Smile Drive to collect oral care products for children in need. • Providing a dental health presentation at a local health fair. • Visiting a dental office to learn how dentists and dental hygienists help patients maintain good oral health. • Presenting dental health educational lessons to younger Scouts. • Conducting healthy food or water demonstrations. • Planting a Smile Garden. Since the program began, America’s ToothFairy has awarded more than 25,000 Scout patches to Scouts across the country. This is the third year of funding from DentaQuest for the Scout patches. Scout Troops in New York, Florida, Texas andMichigan can learn more about the program and register at www.AmericasToothFairy.org/program-resources/hero. DentaQuest is a purpose-driven oral health care company that is dedicated to advancing oral health for all. We bring a uniquely holistic perspective to our work, as we manage dental and vision benefits for more than 27 million Americans and provide direct care to patients through a network of more than 85 oral health centers in five states. DentaQuest provides flexible and customized dental solutions for Medicaid and CHIP, Medicare Advantage, small and large businesses and individuals throughout the U.S. Clients range from state governments to leading health plans. DentaQuest believes that business performance and social impact go hand-in-hand and has provided more than $200 million in funding for research, grants, and programs to advance oral health in communities across the country. Our mission is bold – our commitment is strong. By advancing oral health for everyone, we will achieve better health for all. Welcome to Preventistry. To learn more about DentaQuest and Preventistry, visit Preventistry.org, and follow us on Twitter @DentaQuest, Facebook www.facebook.com/DentaQuest, Instagram @Inside_DentaQuest, and LinkedIn www.linkedin.com/company/DentaQuest. 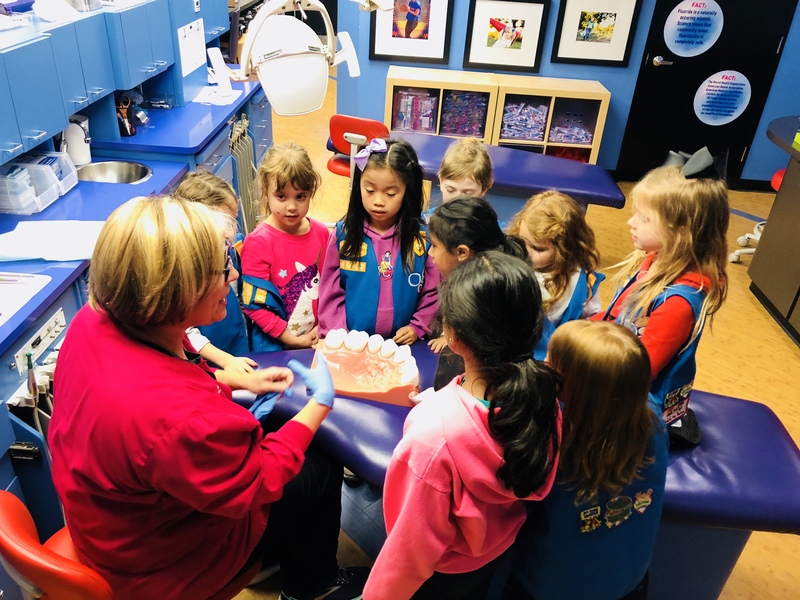 Girl Scouts from Troop 4042 learn about proper oral health from a dental hygienist during a visit to Giggles and Grins Pediatric Dentistry in Southlake, Texas. The visit was part of their project to earn Oral Health Action HERO patches from America’s ToothFairy and DentaQuest.